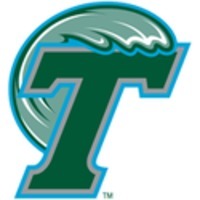 Logo of a college football team that currently plays in the American Athletic Conference, the University of Tulane Green Wave. The program began in 1893 and has played in various conferences and as an independent, winning 9 conference titles and 5 bowl games over the years. Tulane alumni who have played pro football include Max McGee, J.P. Losman, Warren Bankston, Bubby Brister, Steve Foley, Matt Forte, Rodney Holman, Ed Khayat, Dub Jones, Don Joyce, Tommy Mason, Eddie Murray, Richie Petitbon and Lionel Washington.